Would you like an easy way to support Woodlands Hospice? 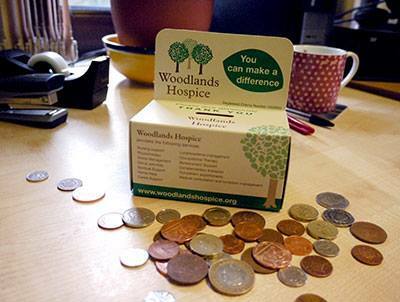 Our Home Collection Boxes are the perfect way to collect your loose change and support our work. Every day, people with life limiting illnesses turn to us for help and we rely on donations to continue our work. If you’d like to help by collecting your loose change at home, just email anne.harley@aintree.nhs.uk or call 0151 529 2968 to receive one of our collection boxes. Whether it sits on your phone table, desk or kitchen windowsill, you can use it to collect your change to help fund our work. Thank you – every penny really does make a difference!